A recent post on Mashable listed “You Can’t Have Search Without Social” as a best practice for SEO. However, the post only had a small, quite vague paragraph about the subject. This reflects a common trend: social media is often mentioned as important to SEO, but rarely do writers go into the nitty gritty as to why and how – so social media is still regarded by most people as less important than other SEO methods such as keyword optimisation and linkbuilding. So let’s break it down to see how this whole “You can’t have search without social” thing works. I’ll explain why things such as links from social networks, re-Tweets and other social activity can directly impact keyword rankings – and show you the proof. 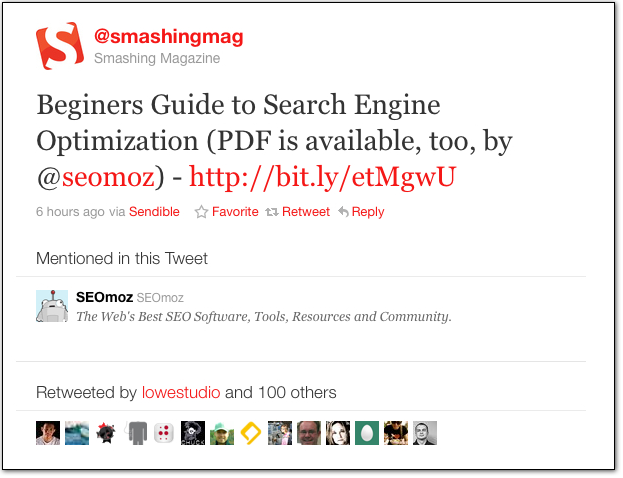 A very nice article by SEOMoz showed the power that one tweet can produce. One tweet, re-tweeted, and then re-tweeted, saw them ranking for “Beginner’s Guide” – a very general term, and not easy to rank for – on spot 4 within the first day! Studies have shown that posts with 10 or more tweets are usually ranking on the first page for less competitive to moderately competitive terms. Google crawls various social media websites and profiles in an attempt to make connections between them – your Facebook friends may affect your Google rankings, even though you haven’t linked your Facebook with any Google services. It can then find connections several layers deep, and use them to customise your search results. If your contacts are ‘Liking’ content related to a subject, product or service, then the person or company that produced it will be considered more authoratitive because it has been validated by your social group. Powerful contacts make powerful allies. Finding influential people is the key. Whether it be on Twitter, Facebook, Google+, LinkedIn, or their own personal blog, these are the people you want to be getting social with. Soliciting content from these people can give you social proof. If a rockstar in your industry shares your content or mentions you to his or her network, this will usually result in it being reshared on multiple Facebook, Twitter and Google+ pages, thus growing lots more links to you. To make it easy for others to be social with you, you should always embed Facebook Likes and shares, and Google+1s onto whatever content you produce. While you may only get a small percentage of readers socially engaging with your content, this is free branding and backlinks. To make it easy for you to share your content with as wide an audience as possible, use tools like onlyWire to post to all your synced accounts at once, saving you from having to re-post things on multiple platforms. Basically, if you are popular, users will follow your links, and link back to you. Connecting your website or blog with your social media profiles can mean that your accounts receive constant updates without all the hard work of having to repost the information many times. Spam can be a double-edged sword. It can temporarily fool the SERPs, if you are careful, but your reputation and branding with real people will be forever destroyed. Tread lightly. There is more to social media than just posting quality content – you need to interact with others, comment or promote different blogs and social media profiles, and become an authorative presence in your field. If you just give what everyone already knows, no-one will come to you for information. If you give away some of your secrets, you will become the place people come for information, and it will repay you many times over. With search engines taking social media and social proofing more seriously everyday, getting your content shared is more important than ever. Spreading data across several networks and platforms can bring in the necessary social branding you need, but only if the reputation you garner is actually meaningful to your followers. With so much content out there competing for attention, you need to be sure you’re creating something that people want to share. 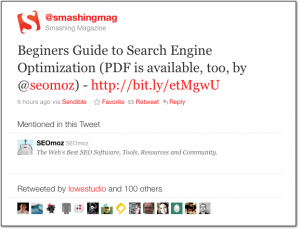 I hope that this post has cleared up the why and how of social media as it relates to linkbuilding and SEO. If you think I missed something, or have any other questions, please let me know in the comments below. Thanks for reading! Thanks for sharing this article. I find it difficult to be “present” in spite of my efforts on making my website as updated as possible. These suggestions are helpful in increasing my position in SERPs and making my site more user-friendly. Pingback:	Are You Maximising All That Online Marketing Has to Offer?